Told ya I’d get to some emails!!! If you are attempting to do serious western fashion, i’d say eh. unless you are a rodeo queen, I wouldn’t do it. but, if you are going for “different”, its a yes. I am a bad, bad blogger. buy them from her…isn’t she talented?! omigawd. these need to be mine. yes, it has been a while. i am posting so randomly these days. today’s post is for BRANDY!! she wrote me asking for help styling her new skirt. super cute, and can work so many ways!! anyone else have a boot “problem”?! please tell me i am not alone?! every time i try on a pair they fit like i have owned them for years. and my husband is a convert too. (and i didn’t even influence him!) he just came home one day with THREE new pairs of boots. 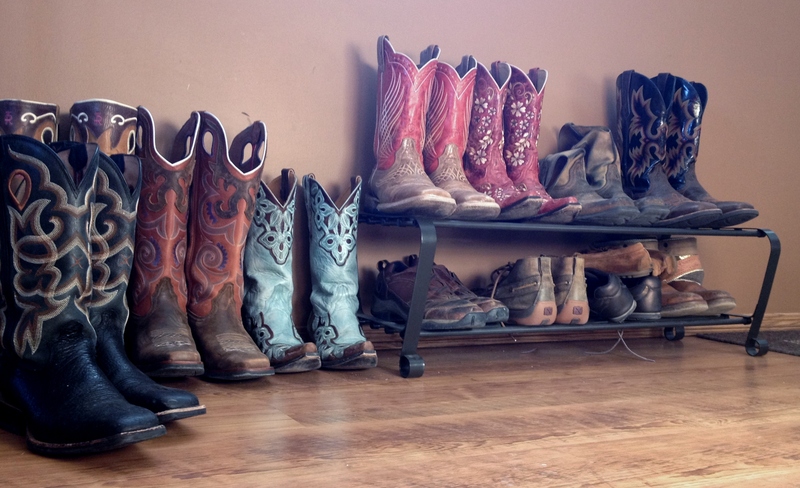 all Ariat. and those brown shoes in the lower left corner? i have had those bad boys for over 10 years, and they are still 100% perfect. no seriously. there are no rips, fabric breakdown or worn soles. anyone else have a pair of something that has aged that well?! and um. i am now wanting/needing these. think my husband would notice if they were accidentally added to the collection? !